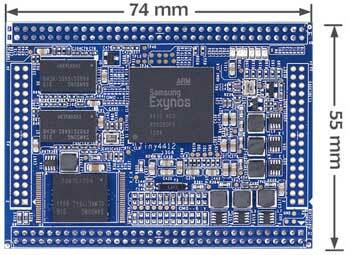 Tiny4412 is a high-performance quad-core Cortex-A9 core board, from CoreWind design, production and distribution sales. It uses Samsung Exynos4412 as the main processor, running at up to 1.5GHz. Tiny4412 Contain one CPU board(CM-Tiny4412) and one base board(Tiny4412SDK). The CM-Tiny4412 use a 2.0mm pitch double-pin (P1, P2, P3, P4) that lead out 208Pin, which size is 74x55mm. It comes standard with 1GB DDR2 memory and 4GB of high performance eMMC flash (optional 8/16/32GB eMMC Flash). 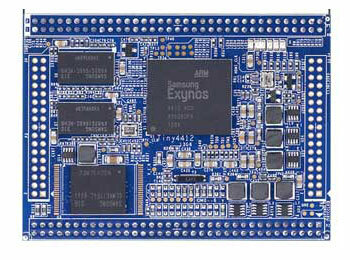 CoreWind also offers customer design service based on the CM-Tiny4412 board according to customer’s requirement. Whether you need to reduce, add or modify to existing hardware, CoreWind will help customers with expert competence and rich experience.